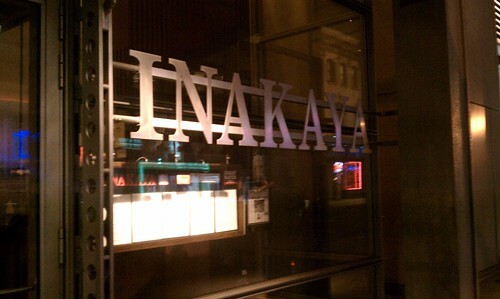 One night in December, Marcus surprised me with a dinner at Inakaya, located on the south side of The New York Times Building on 40th Street. When we arrived inside, the mâitre d' asked us whether we wanted to be seated at the counter or at a table. 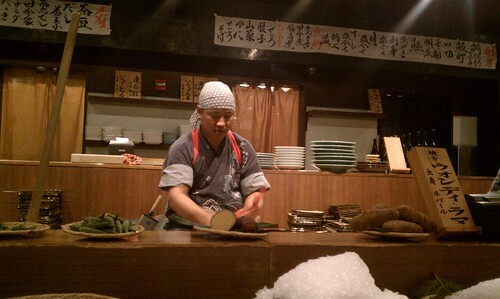 We opted for the counter, as the whole restaurant centered on what appeared to be a robata-yaki grill. The first time I had seen one was back in Hong Kong, when I made a visit to Zuma, located in The Landmark shopping center in Central, a trendy Japanese hotspot. It had the typical sushi bar counter, but along with it, Zuma had a robata grill, where quality meats, fish, and vegetables would be grilled to order over robata charcoal. I didn't really think much of it at the time, probably because it was placed in a modern setting. Another noticeable aspect of the restaurant is there is a lot of shouting exchanges in Japanese between the robata chefs and the restaurant's servers--so expect lots of excitement during any future visit to Inakaya! 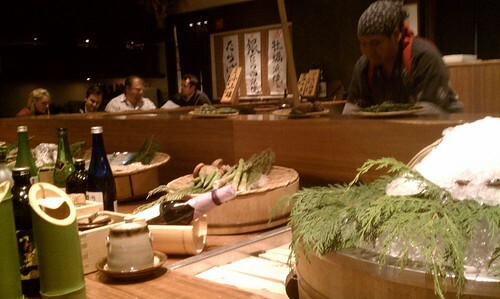 This is what the robata-yaki counter looks like at Inakaya. I wish I could've had my DSLR handy, but alas, this lovely surprise had to do without it. I admit that my HTC Incredible camera phone doesn't do the space much justice, but it'll have to do for this post! Anyway, the restaurant's menu offered a brief background about the origins of robata-yaki. Robata is Japanese for "around a sunken hearth," and yaki means "grilling." Families used to gather around the hearth for dinner, eventually evolving into robata-yaki style cuisine, where fresh ingredients are cooked on an open flame for those sitting around to observe. At Inakaya, the counter guests are like those surrounding the hearth, with each of the three robata chefs kneeling in front of a grill and flame. Also, ingredients listed on the menu are displayed surrounding the robata cooking area over ice. As a mushroom fanatic, I made sure we started with an order of enoki mushrooms, robata-yaki style. Enoki mushrooms have this nice balance of crunch and chewiness that can only be explained or understood having eaten them before. The robatayaki preparation had this nice smokey, grill flavor which maintained the main essence and flavor of the mushrooms. Very organic and earthy. Marcus and I saw kinmedai (Japanese for golden eye snapper) available on the robata grill menu--the same type of fish we had tried for the first time at 15 East, the one where the sushi chef used a blow torch to sear the fish's skin. The menu described it to be a "large and premium pole-and-line fished snapper from Japan". 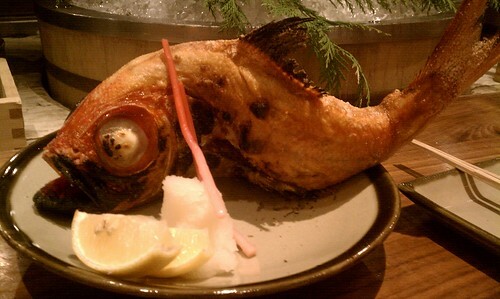 It also mentioned that it is served as a whole fish, grilled with sea salt on the robata grill. While we were contemplating the kinmedai, we also saw the robata chefs serve the couple sitting next to us at the counter the actual whole kinmedai! It looked beautifully crisp and pretty sizable, that is, to be shared between two people. However, when we saw that the listed menu price was M/P (i.e., based on market price), we weren't sure what price range to even expect. After consulting with our waiter about the price (a whopping $130, to our dismay), we decided to go for it, with the same rationale as we had with the white truffle burger from B&B. 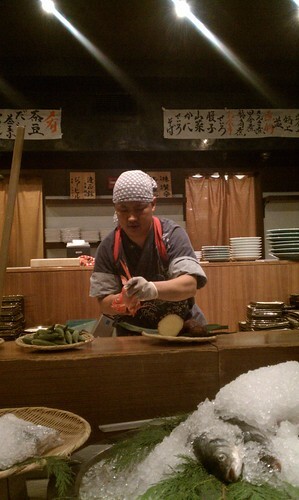 Here is the robata chef preparing our kinmedai to be grilled. Looks like he's cleaning it and then seasoning it with sea salt! When the snapper was seared and ready to be served, the robata chef placed the dish on a long wooden spatula (which resembled a pizza peel to remove hot pies and slices from pizzeria ovens) in order to hand it to our waiter, who in turn served it to us. 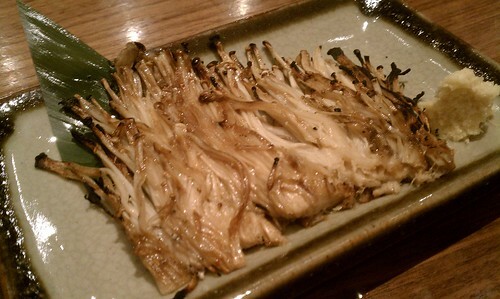 So here's the freshly grilled kinmedai from the robata grill at Inakaya! Notice this fish actually does have a "golden eye" as described in its Japanese name. 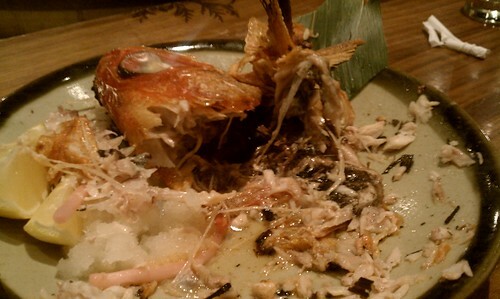 The skin was really crispy, well-seasoned, and not at all oily, while the meat from the fish was very moist and tender. We barely even had to do much work to get pieces of kinmedai onto our plates from the whole fish--the texture and richness sat on tongues as the pieces of fish melted slowly in our mouths. The combination of the crispy skin and the savoriness of the kinmedai was absolutely delicious and perfect for a dinner to be shared by two people. I really liked the clean and simple flavors (fresh whole fish along with the simple seasoning of sea salt as well as the robata-yaki grilling technique), making for an enjoyable experience. And besides, no one can't beat that kind of presentation! The "damage" after eating every late bite of the whole kinmedai! 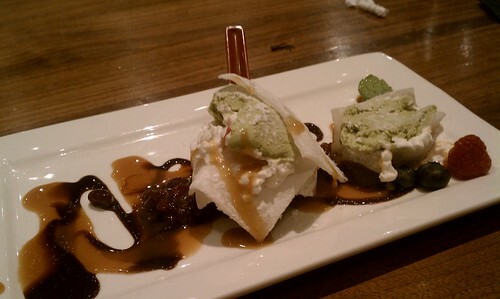 We ended the meal with layered mochi ice cream for dessert, which consisted of green tea ice cream, layered with flat layers of mochi, (i.e., Japanese rice cake made of glutinous rice pounded into paste and molded into shape), drizzled with chocolate sauce. I found this dessert to be a refreshing finish to a very flavorful dinner! And as an additional treat, the restaurant served us two pieces of fresh mochi (green tea flavor in green and soy bean flavor in beige). These pieces of fresh mochi were prepared by selected restaurant guests in the traditional manner called mochitsuki, which used to be essential in celebrating the Lunar New Year. Mochitsuki was seen as an auspicious gesture that signifies hope for a happy and bright year ahead. The resulting mochi from this process (called kagami-mochi or okasane) was typically made as an offering to the kani (i.e., the deity), comprised of two mochi cakes (like in the photograph below) usually placed on a sheet of pure white paper in the center of a wooden tray. This traditional mochi-pounding ceremony in Japan has three steps. The first involves soaking polished glutinous rice soaked overnight and cooked. Then, the cooked rice is pounded with a kine (i.e., wooden mallets) in an usu (i.e., a traditional Japanese mortar). Two people alternate the work, one pounding and the other turning and wetting the mochi, while importantly maintaining a steady rhythm to avoid accidentally injuring one another with the heavy kine. After the pounding process, the stick mass is then formed into various shapes (typically a sphere or cube). So while we were eating our dessert, there were individuals pounding away, near the window of the restaurant, at an usu, each using a kine, alternating at each turn, shouting things in Japanese. 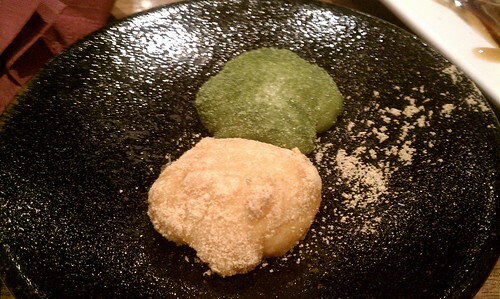 We had no idea what they were doing until the server came by with a dish of mochi cakes for each of us. Marcus and I really enjoyed both flavors of mochi very much (though Marcus was a little more partial to the green tea flavor)--they had a fresh chewiness to them, and the flavoring on the outside added some depth as well. Findings: I love it when I find a restaurant that is authentic as the cuisine comes. The set-up of the robata grill and the incorporation of mochitsuki definitely adds a nice panache to what would have been another neighborhood-y Japanese restaurant. The spirited nature of Inakaya also contributes to its welcoming environment--there's lot of lively, cheerful exchanges between robata chef and restaurant server as well as when guests participate in mochitsuki. It is also really fun when you get to watch someone prepare your dinner, right before your eyes, from seasoning to dinner service, especially on an open flame. So if you're looking for some place very different than what you may have experienced at a neighborhood sushi bar, I would strongly consider making a visit to Inakaya. The splurge on the kinmedai was a quite a bit, but I think it was totally worth it and definitely worth the experience. I'd love to return back here to try the other side vegetable dishes (they had a very wide selection of popular Japanese vegetables) as well as other fish offered on the menu that doesn't hurt the wallet too much. Price point: market price ($130 during our visit) for a whole kinmedai (robata-yaki style), $8 for dessert.